Why not leave the Easter eggs this year and have a go at this cute Easter cupcake recipe instead. Rachel offers vital advice on making cute cake decorations, from sugarpaste bunnies to mini egg chicks. You might argue that cupcakes have had their day, and I do agree that recently there has been cupcake overkill. I’ve also had enough of dry cupcakes in shades of pink that leave glitter all over my face. But have a think about all the ways that cupcakes can be decorated, to reflect celebrations, occasions, and times of year. At their best, cupcakes are colourful, are great to look at, and they can even make you smile. That’s a lot to be appreciative about from a piece of food. I had lots of fun making these Easter cupcakes. They would be great to have at an Easter egg hunt, or with a cup of tea afterwards, and kids will love them. The bunnies and carrots are made from sugarpaste with gel colours. To make them, roll all the parts into balls first, and use a tiny bit of water if you need to help it all stick together. 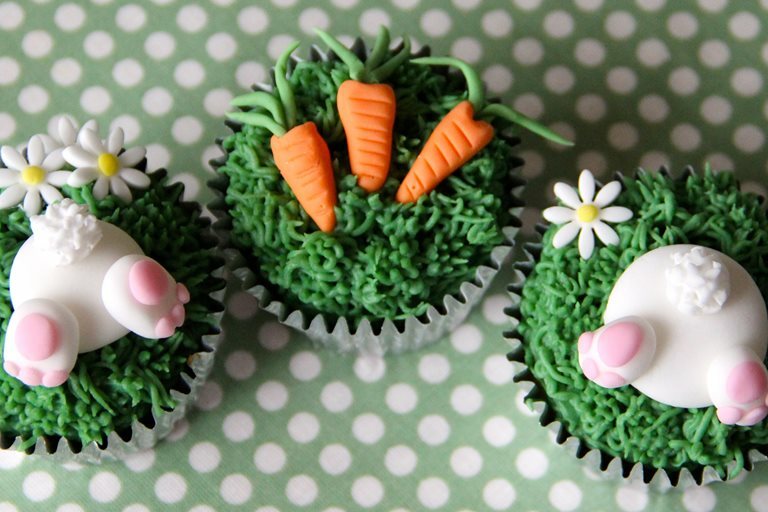 The bunnies are burrowing into green buttercream piped with a fabulous grass piping nozzle. The chicks are simple – just take Cadbury’s mini eggs, add a sugarpaste beak and dab a little bit of gel colouring for the eyes. You could use an edible pen for this too if you have one. Their nest is buttercream sprinkled with broken up Flakes. I have to admit a lot of Cadbury’s was eaten while these were being made… And the cupcakes taste pretty good too! Once incorporated, turn the mixer speed up and beat for about 5 minutes, or until the frosting is light and fluffy. Then use food colourings to create whatever shade you like!